In recent years video production has become a hot commodity for brands. As different social platforms continue to favor video content in varying lengths and formats, a growing number of businesses are in need of film and video production. Below is a new way to look at video production – and a way to not only stretch your production dollars but the overall effectiveness and useful life of your campaign. The first thing you should do is start at the highest level of questioning: What is the big story that you’re trying to tell? Once you can answer this, then the smaller parts of the story – where you can take a deeper dive and get more granular – will naturally fall into place. 1. The brand film is typically a longer piece that covers a broad story arc and shows off your company/campaign in a compelling and inspiring manner. It will hit on the key messaging components of your video. 2. The supporting pieces are stories in their own right that may not have gotten enough coverage in the brand film. Perhaps they involve other characters that have more to share, or other business objectives that weren’t able to be fully covered. 3. The teasers can really vary and may be very small edits: a snippet from the larger film, or even final frame grabs from the brand film, but the main thing to know is that these are short pieces that can be used to help tie recall and recognition for your campaign back to your objectives. The next best thing you can do is ask yourself, “How do I want to distribute this?” (Our Strategic Input Brief that we use to help shape your overall production always prompts this question. Download it for free here.) The goal is to build a web of video content, where viewing one video independently can lead you to the next video, OR viewing one video will help your customers recall your campaign from another platform. Additionally, asking yourself, “where will customers see my video?” will help you understand how much video, how long each piece needs to be, and how your experience needs to be designed. With more than half of all video viewing coming from mobile devices, it’s more important than ever to have a distribution plan. Long form, mid form, and short form should all play a part in your strategy (part of the hierarchy). Here is a quick look at different lengths that will help define your strategy. You have a variety of channels at your disposal. With Facebook, Instagram, and YouTube dominating video viewing for most brands, you will need to fully map out your digital video experience to ensure that your video production converts. You have probably heard of “the long tail.” A long tail occurs when an event or investment continues to provide impact and value over a long period of time. The same thing can happen with video. 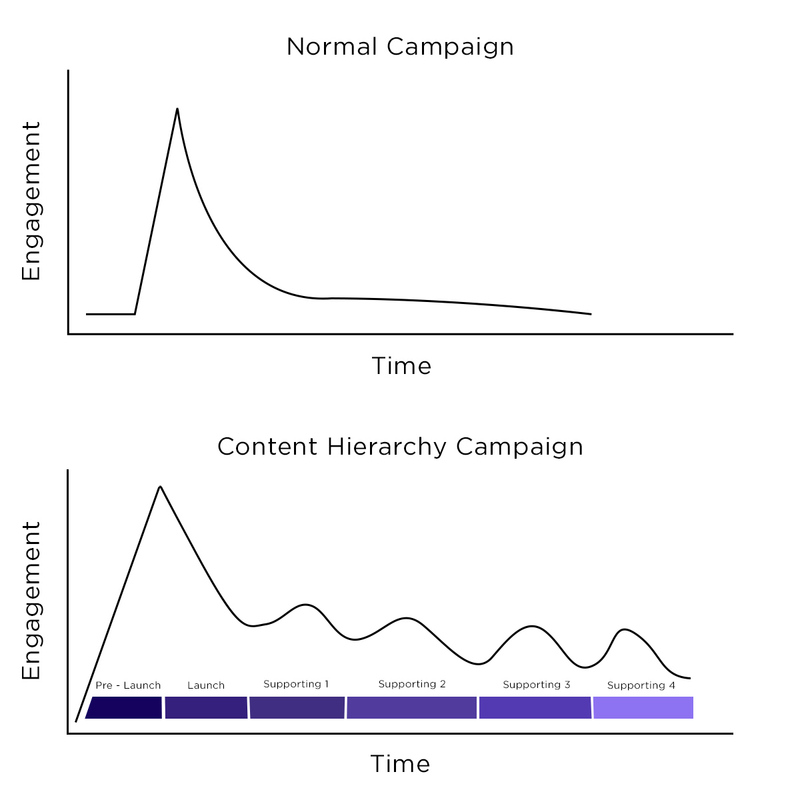 In the image below you can see a normal campaign and a campaign that is created with a content hierarchy in mind. 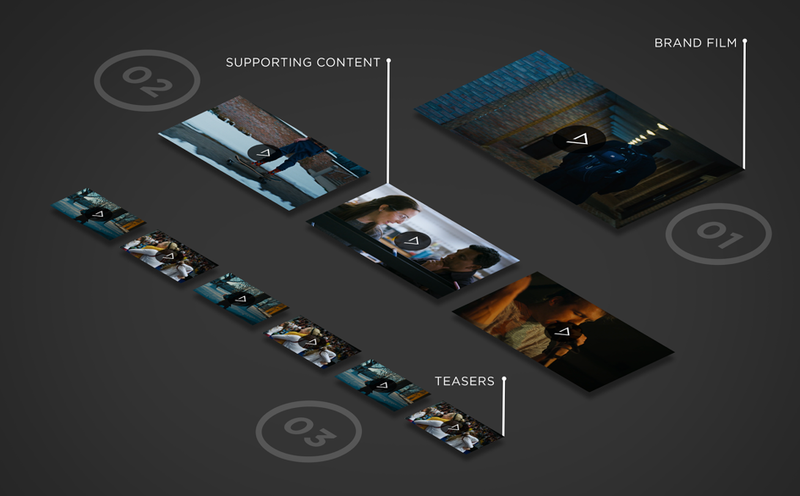 In the normal campaign (top image), engagement spikes at the release of your video and slowly tails off. In a campaign that uses a content hierarchy approach, engagement peaks at the release of the brand film, but then can continue to spike with the subsequent release of supporting content and teasers. The net effect is a “video stretching” that increases the return on your initial investment for a fraction of the original price. And if you’re really savvy, an effective pre-launch strategy can create engagement even before you launch the primary campaign film. Remember we’re not even discussing look, style, feel, tone and messaging – those things that make for engaging content that people want to watch. We’re simply discussing how to get the most out of your production from a strategy standpoint. By going into production with a full list of the shots you need to fill your hierarchy AND where these edits will appear, you will be better setup for a successful campaign. This level of planning and strategy creates maximum reach and engagement for your video investment and ultimately your campaign. You’ve just chosen the video production company you want to hire for your next campaign, what is next? Talk to them about how you want to use video and how you see this fitting in with a broader campaign. Use the hierarchy to describe how you would like to go into production with intent. Let them know that using footage from a single shoot will produce a campaign’s worth of content. This will not only maximize your investment in terms of content, but also the life-cycle of your campaign.